Complete your yoga practice with a good yoga mat. Like the different types of yoga forms, yoga mats are available in a range of choices. From thin to thick, with an open cell structure or closed cell structure, normal grip or sticky grip, broad and long lengths. Good yoga mats come in different types to meet the needs of every yoga practitioner. In order to ensure that you, as a yoga practitioner, always have a solid and comfortable basis for performing yoga, it is advisable to use a yoga mat that meets your movements and yoga style. Yoga mats are made in different thicknesses, materials, styles and colors, each factor offering special advantages for different users. Buying a yoga mat but which one? Do you want a freshly coloured yoga mat or a mat with design? Buy a yoga mat that suits you. Yogini not only has a wide range, but always tries to offer the lowest price and only sells sustainable high quality yoga mats. Choose from professional yoga mats, standard yoga mats or ecological yoga mats. We have yoga mats for everyone. Thin, lightweight mats are useful for travel, while thicker mats with extra grip are perfect for yoga or pilates. The thickness of your yoga mat sometimes differs per yoga style. When you practice many standing postures and balance exercises, a thinner mat is fine. This way you have more grip on the ground. When you make a lot of lying and sitting postures on the mat, a slightly thicker mat is fine. This prevents pain on your knees and spine. 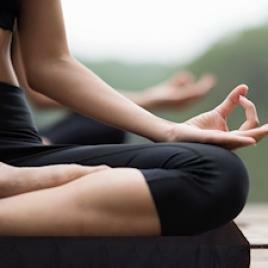 Yoga mats are available in thickness between 1 and 10 mm, the most common thickness is between 4 and 6 mm. The material of a yoga mat influences the grip, structure, comfort, durability and environmentally friendly. For example, PVC is advantageous and sustainable, but less beneficial to the environment. In contrast, eco materials are slightly more expensive, but free of toxins and more sustainable for the environment. The right material depends on the style of yoga, personal preference and how the body responds. 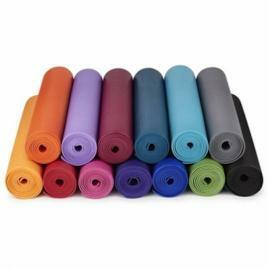 Most yoga mats are made of PVC, also called Sticky Yoga Mats. These mats have a good grip, so that during a yoga posture you do not slip and the mat stays on the floor. There are different qualities in PVC mats. A good quality PVC yoga mat is suitable for all yoga styles, has a long lifespan and some of these mats are virtually indestructible. PVC yoga mats become increasingly stiff with longer use, which means that the mat gets more grip and is therefore finer in use. If you prefer an environmentally friendly yoga mat, you can opt for a TPE mat. This type of mat is a combination of plastic and rubber. TPE is free from harmful substances, hypoallergenic and 100% biodegradable. The mat has a good grip. TPE is softer than PVC, which offers more comfort in sitting and lying yoga postures. This yoga mat suits well with yoga styles such as Yin Yoga and Kundalini Yoga. Because this material is soft, balance positions become a slightly larger challenge. Due to the open cell structure, this mat will have a shorter life span with active yoga forms such as Ashtanga, Power, Vinyasa Flow and Hot Yoga. Yoga mats made of natural rubber are naturally an environmentally conscious choice. Natural rubber is sometimes also processed with another material such as cotton or jute. These yoga mats have a very good grip, even with moist palms and feet. Natural rubber mats have a slightly less long life than TPE, and wear faster with intensive forms of yoga. Natural rubber has a 'specific' smell that gets less over time. So keep this in mind. A natural rubber yoga mat is ideal for grip and comfort. Bodhi Yoga and Yogitri have also made yoga mats from other materials, such as cotton or sheep wool, which provide comfort in a different way. 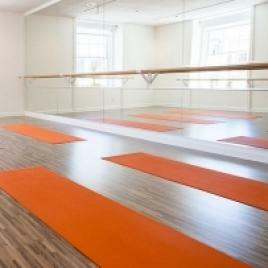 You can purchase yoga mats and accessories from Yogini as equipment for your yoga studio. Wholesale discount prices are listed on each yoga mat product page. With many yoga poses a stiff mat with a good grip is desired so that hands and feet do not slip away. A yoga mat should therefore have a certain stickiness, such as the sticky yoga mat. The skid resistance is determined by the material, the production process and external conditions such as temperature and humidity. Perspiration and humidity influence the skid resistance and therewith the grip of a yoga mat. A mat made of rubber is an excellent alternative to PVC mats. Rubber is naturally stiffer than PVC and remains stiff with perspiration. A yoga towel can help for extra grip during perspire. Especially with Bikram Yoga and Hot Yoga special yoga grip towels are used, these moisture absorbing towels are available with special PVC 'studs' that provide extra grip. Stickiness is a measure of how well your hands and feet stick to the mat. It is not a sticky feeling, but rather a sucking stickiness that helps you to hold your pose comfortably and to maintain proper alignment. PVC and TPE mats have the highest stickiness factor, while rubber has a slightly lesser amount. Make sure the mat stays clean as it can affect the grip. Cotton and jute yoga mats have virtually no stickiness. Why stickiness is important? A sticky yoga mat ensures that hands and feet do not slip, and helps you to keep your alignment while you move from one pose to another, as well as when you hold postures for a few seconds.